Read Industrial designs and manufacturers its own liquid ring pumps. We also supply pumps from manufactured by Gardner Denver. Which vacuum pump is best? Liquid-ring or blower type? That depends on the size of the plant. For anything greater than a 40 bail milking system, a blower type pump will work better. This is because they are able to maintain vacuum levels under higher airflow conditions (cups off). For plants smaller than 40 bails, a liquid-ring pump offers better long-term running costs and quieter operation. A 20-30 year service life is typical for our liquid-ring pumps; compared to around 10 years for a blower pump. The cost of reconditioning a liquid-ring pump is lower compared to a blower. They are also able to cope with contamination (e.g., milk) better. 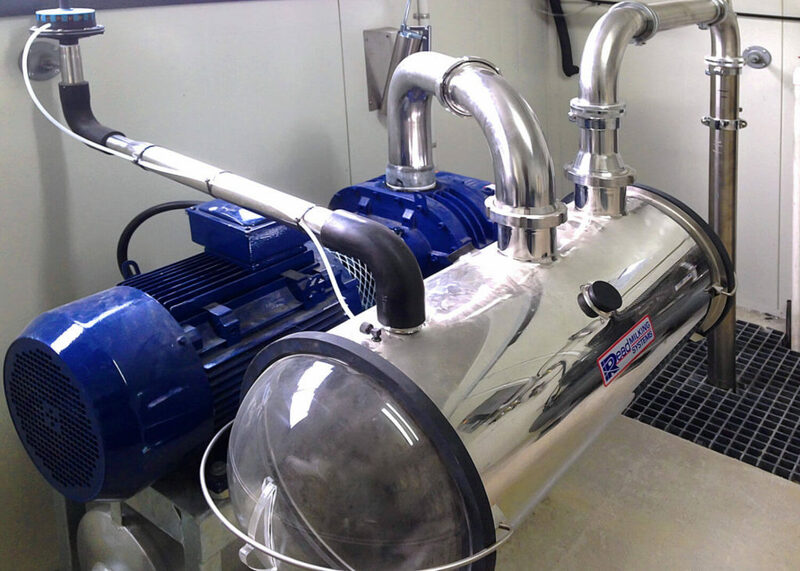 For these reasons, the liquid-ring type pump is preferable for smaller dairy plants. Read Industrial manufacturers two main types of liquid-ring vacuum pump. We offer a standard Water Ring (WR) vacuum pump, suitable for maintaining 48 kPa vacuum pressure at airflow rates of up to 4,000 L/min. A compact version, the Water Ring Compact (WRC), is suitable for maintaining 48 kPa vacuum pressure at airflow rates of up to 3,000 L/min. Both operate in recirculating or non-recirculating (total loss) modes. We offer the choice because some farms have plentiful water supply, whilst others may be strictly limited. Use a non-recirculating mode if a flow rate of 10 L/min or more is available. Particularly in hot climates where water temperatures may be high. Use a recirculating mode if water supply is not abundant, or if the climate is cold. There are three advantages to running in non-recirculating mode. First, maintenance is lower because impurities do not remain within the pump. Second, the pump uses a smaller water reservoir which lowers its footprint within the plant. Third, this mode tolerates water hardness up 200 ppm, potentially saving on water filtration. The disadvantage is that it is more wasteful of water. Recirculating mode overcomes this disadvantage. But, it requires a larger water reservoir and water hardness to be <100 ppm. 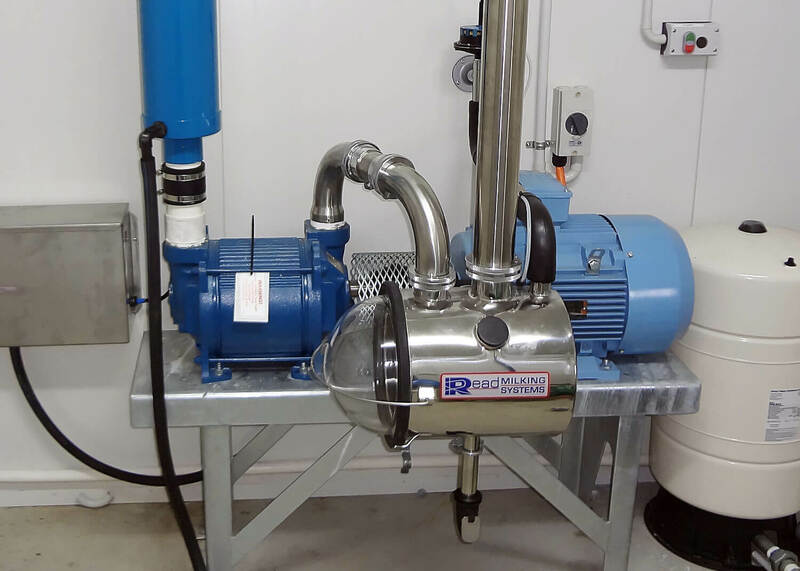 We install Gardner Denver Sutorbilt Legend vacuum/blower pumps in larger dairy plants (e.g., 60-100 bails). Though less quiet in operation, these pumps are capable of maintaining 48 kPa vacuum pressure at airflow rates of up to 14,000 L/min. Low-friction twin contra-rotating impellers produce a constant airflow transfer from inlet to discharge with every rotation. Built to a high standard of engineering, the Sutorbilt Legend is reliable and efficient.